I am pleased to announce the nicest Irish Job board: Green Jobs! A this is second new job board I am looking at today, and funnily enough the first one was also ‘green’ or perhaps a bit to ‘green’! Anyway back to Green Jobs! It is again the jobs site owned by the recruitment agency, and the good thing is – they do not hide it a bit! 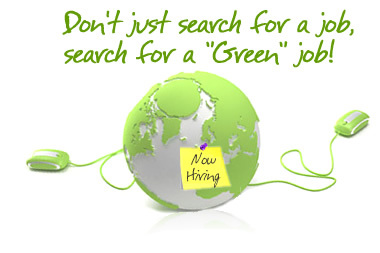 Their Green Search logo is proudly displayed in the header next to the Green Jobs one. The design of the Green Jobs web site is probably the nicest site design of all Irish recruitment web sites. Modern, Web 2.0 (and beyond), light colors on the white background, 3D,… what can I say? It ticks all the right checkmarks! It really is a pleasure to look at, and I find hard to write about it, since I just keep starring at the front page. And not only the front page. When you browse around, you find the little graphics in the site that are relevant to the content, and make the site easier to read and follow. There are some possible improvements on the looks, it could be a bit modernised since some elements are a bit… ‘old’. The latest jobs scrolling make me really nervous since I cannot really read about the job. It’s too quick! Featured employers box ruins the balance, and is over, over,… out-standing. Fonts could be a bit more exiting… But hold on! This is still probably the nicest (Heineken) jobs site in Ireland! PS. If you are a graphic designer who made those graphics please call me on 076 670 8888 now! I have a job for you! Well,…. there is always a room for improvement. Again, there is only one green button, on one page only that leads you to the job search facility. I think a job site’s main purpose is to show jobs. The Jobs Search should be on every page. I will repeat that. The job search should be present on every page. Well not much of SEO on the Green Jobs page. There is actually a test you can do on a job site to check how serious contender are they. You just look at the URL of their job posting. If the page where the job is actually displayed does not contain the job name in the URL, in the TITEL, in the META, in H1 Tag, and a few times in the text…. well then that page will not get much relevant traffic from the search engines. You have to ask yourself – why publish something if it will not have any reach? Well, you be the judge… My take on it is that they will always depend on Google AdWords for the traffic to their site, and we all know that this is not really sustainable way to run a job site. Green Jobs is the nicest little recruitment site in Ireland. It is cute in its simplicity really. Well done and all the best Greens!!! Dont think this site is web 2.0 mate… Think it is like a year behind having any kind of look of web 2.0 and it is actually boring… Did you get paid to write this review? Also, SEO… After 13 years in the web industry, meta tags are more or less useless as they are usually spammed, I cant think of many SE’s that actually use them to bring your ranking up, definately not google anyway. I built a job site for the estate agency in the UK back in 2006, using methods for SEO that you mention, I know things have changed a lot since then… Site is a little old now and due a re-design sqmjobs.co.uk. Yeah actually you are 100% right. Green Jobs definitely isn’t Web 2.0!!! But you have to look at it from a perspective of a person who was looking at the other sites (see previous reviews) that are just… well far more ugly (to put it plain and simple!). So when I saw Green Jobs, I just enjoyed it so much, that I couldn’t find words to describe it! Don’t get me wrong about the META. We all know spiders don’t really care much about it, but META Description is sometimes displayed in the search engine results pages (SERPs) as a description of the site. For that reason it is important to have it, and have it written so that it invites people to click on the listing in the SERP. META Description basically does not help you rank better, but helps improving the CTR to your site from the SERPs – resulting in more visitors to your site. Thanks a lot for your comments Marc.